We have our book back in stock! A second printing is now available. 284 pages of stories and personal photos, including additions to the list of names of Dam workers, bringing the total to over 3000. All proceeds from the book are used towards archival preservation and a museum building fund. Not only a collectible about local history, it makes a perfect gift for Birthdays and "Just Because"...a quick and enjoyable read written by the families who lived those times! This is a collection of stories written by children of the dam workers and other families who came to the Boomtown areas seeking work and a new place to live and thrive. What comes to mind is the proverbial I remember when, as you may find yourself recalling similar times or stories related to you of a different nature. Fifty five different families recall life during the construction of Shasta Dam. Short stories, some are humorous, some are poignant and some simply share memories. Many are a reflection of the hard times of the Depression Era. Several have common themes, such as the importance of children getting new shoes, or the friendships and freedom they enjoyed as children. Other stories depict the changes of living in the area as dam construction continued to provide a boost to the area's economy. Each story showcases personal family photographs. Like painting a canvas one stroke at a time, we have created for you a look at life during those years through the eyes of a Dam Kid. This is the heritage and history of our City today. THE COVER: The Hedstrom family coming to California. Estelle was born on a wheat farm in Salinas, Kansas. She met and in 1937 married Clarence Hedstrom, who worked for a Livestock Sales Pavilion earning $15 to $25 a week. Their house rent was $17.50 a month. 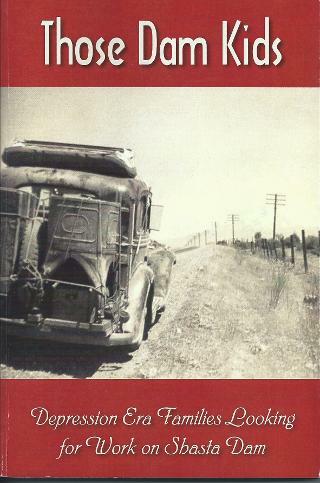 As times grew harder, Clarence was looking for work and they came to Central Valley in 1940. Clarence found work on Shasta Dam. A personal family photograph, we chose it for our cover because it captures perfectly the Depression Era families. Notice the mattress on the roof, the washing tub and family trunk tied on the back...all their worldly possessions. In the faint background, is seen Mt.Shasta as the family heads south towards a new life seeking work on a federal project - the Central Valley Project and the keystone of the project in Northern California - the construction of Shasta Dam. Shasta Theatre aka Pancake Theatre - "the place" to go for the Dam kids. Owned and operated by the Pancake family. 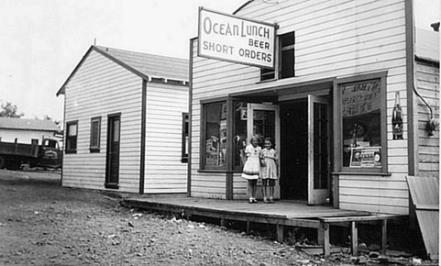 A local eating place during the Boomtown era, located on Shasta Dam Blvd. before it was paved. The Elverud family collection.